Some of the highlights of Norwegian Breakaway. 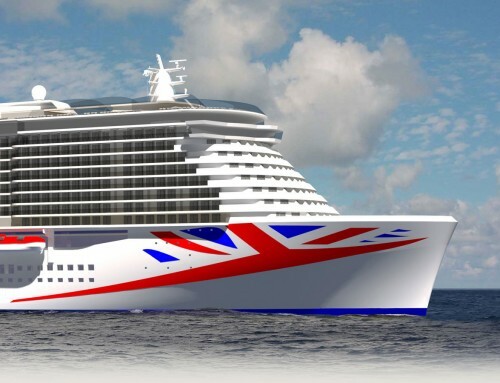 The ship is big, bright and fun and will carry 4,000 passengers a week out of New York to Bermuda, the Bahamas, or the Caribbean, depending on the time of year. Norwegian Getaway, due to launch next year, will be very similar, and becomes the biggest ship to be based in Miami. 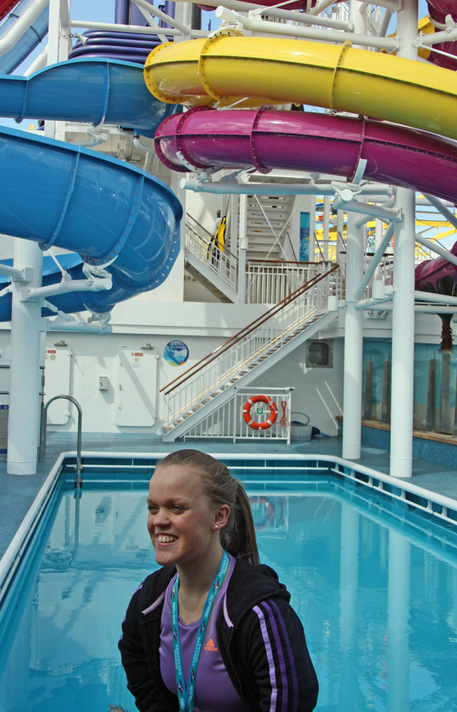 Ellie Simmonds, our Paralympic swimming gold medallist, inaugurated the ship’s AquaPark which contains five watersides including the terrifying 40 mph FreeFall. 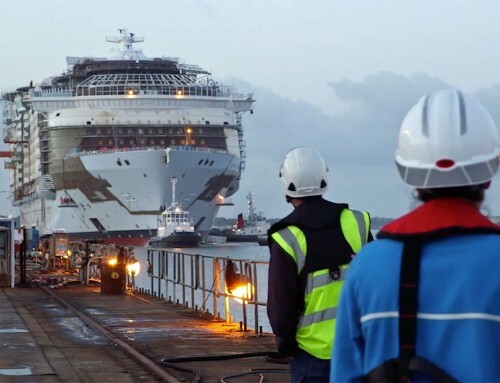 More intrepid passengers will also enjoy the extensive ropes course which includes a zipline track and this walk-the-plank experience for real daredevils. Between the watersides, the rock climbing wall and the framework of the ropes course, it’s almost possible to spot the ship’s funnel ! 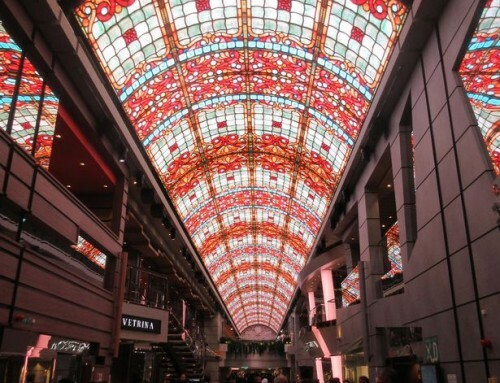 Inside the ship, one of the most eye-catching features is this giant chandelier in a three-deck atrium. Spectacular as it is by day, it looks even more incredible at night. The Bistro restaurant is one of the venues at the lower level of the atrium. And the Raw Bar is one of a clutch of eating places clustered on Deck 8. Further forward is another three-deck-high space, dominated by a giant LED screen which will be used to broadcast sporting events and other entertainment. During the preview cruise, it was playing a featurette on New York’s Radio City Music Hall Rockettes, the dancing troupe who will become the ship’s godmothers next week. La Cucina restaurant is Breakaway’s Italian speciality venue. Cake-aholics will find it difficult to resist Carlo’s Bakehouse. Cagney’s Steakhouse is one of several bars and restaurants which have outdoor seating on the Deck 8 Waterfront – a clever reminder of the fact that cruise ships travel on the ocean. The Moderno churrascaria, Ocean Blue fish restaurant, La Cucina, Shakers cocktail bar, Maltings beer and whiskey bar and the Fat Cats jazz and blues club also have outdoor spaces. This living wall feature in the Haven courtyard – a gated community of first-class suites – was still being completed when I was on board. Its design is echoed in artwork elsewhere on the ship. This piece is constructed of paper butterflies. Solo passengers booking compact single cabins in the Studio complex have their own Studio Lounge for when they are feeling gregarious. Perhaps to find an opponent to challenge to a few frames of tenpin in O’Sheehan’s bar and grill, which is open 24 hours a day. The fun never stops on Breakaway!